This particular meme really angers me. Every time I see it. I find it quite offensive. Forgive me for including it in this post. So let me briefly break down why it makes me want to start a shouting match with the people I see sharing it. Please bear with me. In the top photo, we see rattlesnakes. In the bottom photo we see people. I think it is fair to say that the poster is comparing the refugees to snakes. 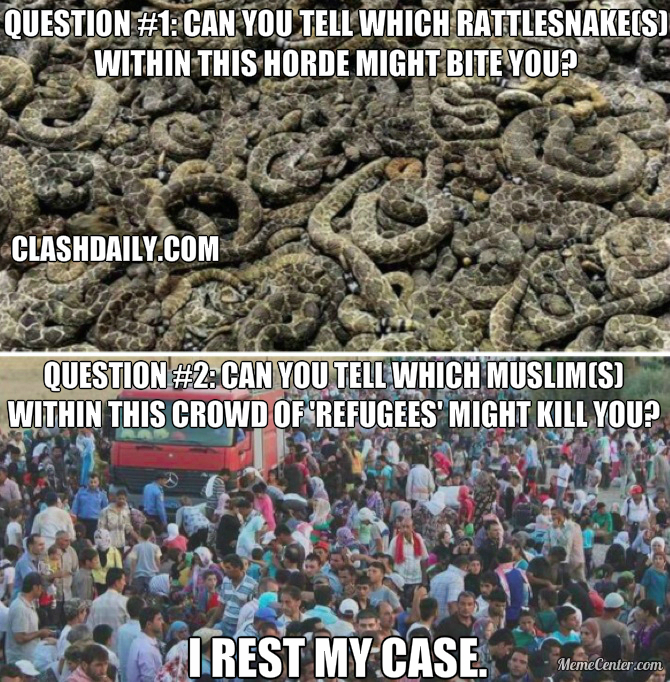 The poster then implies that just like that pile of rattlesnakes, refugees could kill us if they choose to attack. The ultimate argument being made is that the refugees should not be allowed into “our homeland” because they might hurt us, and we have no idea how to tell good apart from bad. Yes. You are right meme creator, some of the people “fleeing” are really “infiltrating” our borders. I can not argue with that. In fact this post bothered me for quite a while because of it’s seemingly unassailable logic. Obviously since we can’t tell good people from bad people we shouldn’t let ANY people inside of our borders. It is just too dangerous. Thank goodness we don’t have people who already live here who occasionally blow things up, or shooting up a school. If we had anyone like that here we would have to kick everyone out of the United States. Oh wait…it turns out people get killed by violence everyday in the United States. It also turns out that most of the daily violence isn’t caused by people born somewhere else. So I agree. Since we can’t tell good people from bad people, it is no longer safe to stay here in the United States. If we are good people, we should all leave to go somewhere else. I guess you could call us refugees and we could start looking for a country that will take us in where we can be safe. What if we all went to Syria? If all the bad guys are leaving to come over here, I bet we would be safe in Syria! We all know there really isn’t anything dangerous happening there to justify the departure of the “refugees”. The sarcasm pouring through my fingers is starting to make me nauseous. So I’ll have to stop. If we are comparing people to dangerous snakes, we can’t just give the citizens of the United States a pass because “we know them” and they are “good for it”. We have to consider each other just as dangerous as anyone else. Most of us will not murder anyone this year (unless you hold yourself to the the standards of Jesus found in Matthew 5:21-22…then we are all guilty) but some citizens of the United States WILL murder someone this year. By the logic of the meme, we can’t trust anyone because we can’t trust everyone. Now, if we consider the religion of the refugees, maybe we can make things a bit more clear. Perhaps we could narrow down who is safe and who isn’t? There seem to be verses in the Quran that condone violence against those who do not believe in the way Allah puts forth through his prophet Muhammad. I haven’t personally read them (and I know perhaps only 2 people who personally have) but I think it is probably possible to make a factual argument that Islam according to the Quran is not the most peaceful religion in the world. Neither is Judaism for that matter (but I digress). 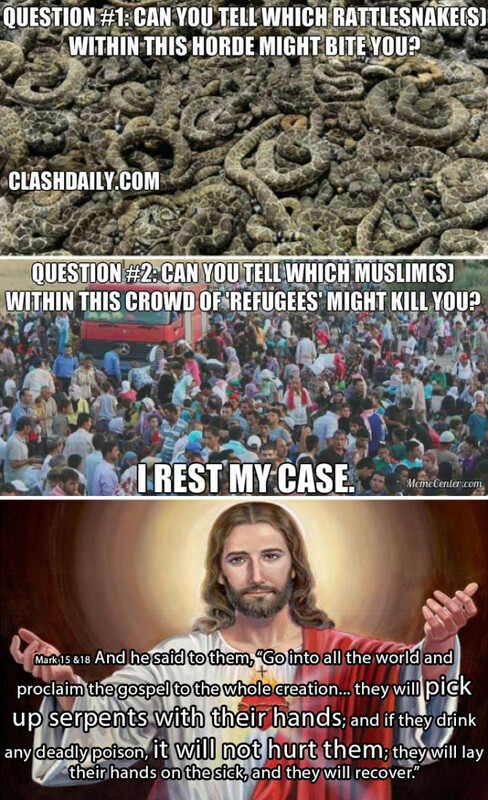 What people who post memes like the ones above are really saying is that because many of these refugees are Muslims, we can expect many of them to be dangerous to us, a “christian nation”. I don’t deny that many people commit murder in the name of Islam. There are also people who commit murder in the name of upholding the ten commandments (Here’s looking at you LRA). Many of those in the IRA during “The Troubles” were at least loosely connected to Roman Catholicism. Violence and religion are well acquainted. I would like to leave us all with some of the words of Jesus found in Mark 16. We could be missing the greatest chance in our generation to reach the lost for Jesus. They want to come to our doorstep. They want to escape the violence they are finding around them. 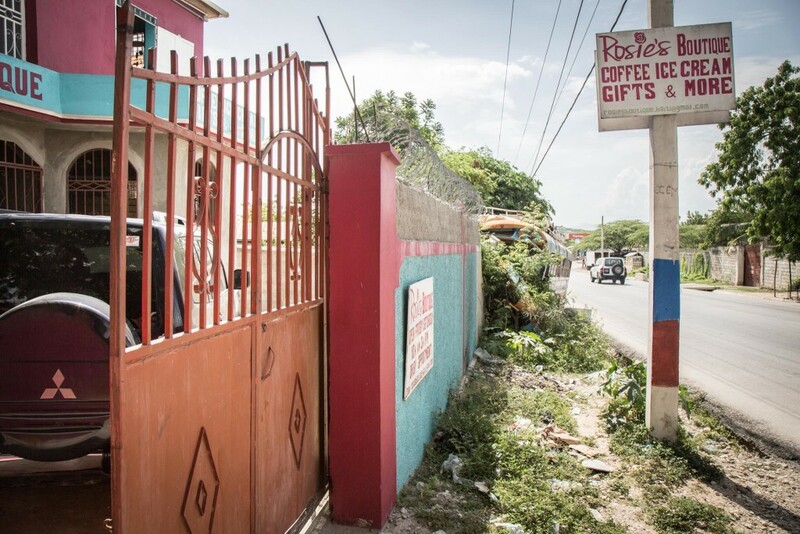 Will we be willing to share the gospel? 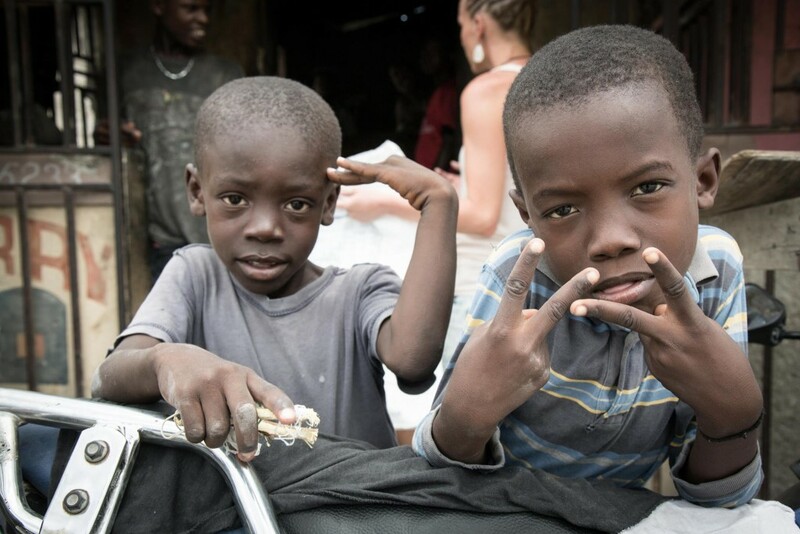 This entry was posted in 25 days for Peace (2015), Perspective on December 7, 2015 by Joshua. It is December, and I have again undertaken the challenge of focusing on Peace, and writing something about it each day during the Christmas season. For the next 25 days I’ll do everything in my power to post a daily reflection of my thoughts. Perhaps more importantly however, 5 other fabulous people are joining me in my quest! You won’t find their posts on my site, so head on over to Facebook and like the 25 days for Peace page (we are considering a website to collect the posts with as well…more on that later). While you are here, I wanted to say thanks for stopping by, and I really do appreciate you taking the time to read (and maybe even subscribe to) my thoughts. I’d love to hear what you are thinking as well, so leave a comment below and I’ll get it approved as soon as I can! Merry Christmas, and I hope you find peace in this season. I keep reading posts on Facebook that say things like “all Muslims are bad” or “all refugees are terrorists”. I have seen people post similar statements about Democrats and Republicans, those who are Pro-Life and those who are Pro-Choice, and even about police officers and other public servants. Everyone seems to have a group of people they don’t like, or that they feel can’t be trusted. Everyone has someone they fear. I used to be afraid of loud noises, like fireworks or airplanes flying by at airshows. The loud noises filled me with fear. In skimming the Wikipedia article about fear, I notice that there are lots of little sub-categories and niches that fear falls into. There are irrational fears, learned fears, taught fears, and phobias, to name just a few. The article discusses them in depth (far deeper than I chose to go) and mentions possible causes for each. When you ask google the definition of fear, it describes fear as “an unpleasant emotion caused by the belief that someone or something is dangerous, likely to cause pain, or a threat. Wikipedia points out (and I agree) that all fear is not bad. The learned fear of pain is what keeps us from touching things we know will burn us. We know that falling from something 10 feet can hurt us, so we are cautious at great heights. A person who can not swim, is often afraid of falling into the water. We justly fear things we know will cause us harm, whether emotionally or physically. In many cases we are kept alive by fear, it is an essential emotion! In some situations fear is not a benefit to us, but is rather a hindrance to us. If I am afraid of rejection I may not be willing to take important calculated risks at my job, or in my personal life, If I am afraid of the people around me, I won’t ask for help when I need it. If I am afraid of failing at a task I want to pursue, I may never start the task in the first place. This kind of fear is difficult for us to ignore, because it is an emotions based fear, and emotions can be fickle things. We often do not have the ability to predict emotional outcomes, so our fear can be justified to ourselves. When we are afraid, when we are full of fear, we need to seek peace. Peace can drive out fear. We often find peace going hand in hand with knowledge and understanding. When we understand fireworks (and are expecting them) we are not afraid of the loud noises but can enjoy them for what they are. 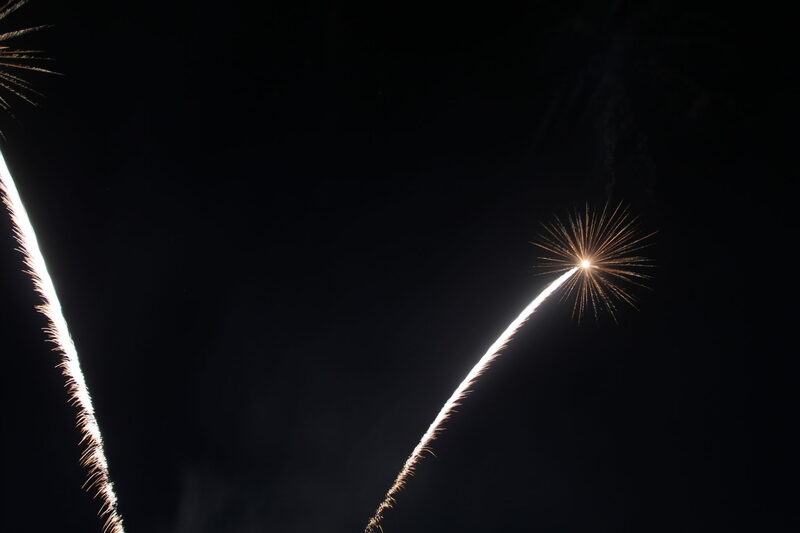 By learning that the noise of a firework is part of how the beauty is created, I chose to accept the noise because of the beauty. A person who learns to swim may find that they have little reason to fear the water anymore. Knowledge can drive out fear, understanding can bring peace. How many times do we fear a religion, refugees, and people who are of a different race, simply because we do not know them, we do not understand them? Maybe we do not have enough knowledge to correctly judge between people who are a threat, and people who are threatened. Perhaps we lack the understanding of the reality of racism in this country, since we have never personally experienced it. I am not saying that we should blindly risk everything for everyone, but I am saying that we should make an effort to confront our fears by making an effort to understand them. What if we started with pursuing knowledge and understanding first? Wouldn’t we know more precisely what we SHOULD fear, and take steps to solve the problems we understand to be there? Wouldn’t we find ourselves at peace more often than we do now? Learn about the things that scare you. This entry was posted in 25 days for Peace (2015), Perspective on December 1, 2015 by Joshua. Late Saturday night, something happened that I have been working towards off and on for quite a while. It happened quietly, with very little fanfare, and it could have easily escaped even my notice. In the grand scheme of things it isn’t even that important, but to me it has been an interesting reminder of what lies ahead for me. I moved to Fort Wayne a little more than a month ago, and after a summer of hotel rooms and long drives back and forth to and from Hicksville, it has been a tremendous relief to have a 5 minute morning commute instead of the hour I had been spending. So far I really love being on my own, with no one to worry about but myself. I have been eating less fast food, and even have found time to read in the evenings again. 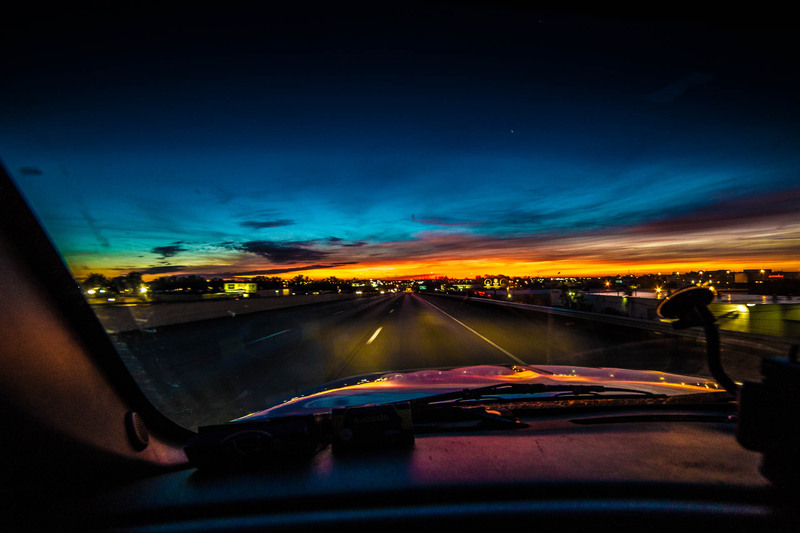 I don’t miss the early morning drives, but the sunrises were pretty special. One of the reasons I thought I would love it so much is because I would finally have some free time to spend on projects that have been sitting on the back burner. At any given time I have at least 15 different things I want to do. There are fun projects like learning to play the piano, finishing the cello I am repairing, learning to play the cello, filming an artsy project, filming some funny videos with some friends, and reading several book series. There are also more serious projects I want to work on, like the resurrection of my political website, or preparing for the second year of 25 days of peace. I have a series of fictional blogs I want to write, and hours upon hours of video to edit for NGO’S in Haiti and Nicaragua. I have even started a movie script that needs to be finished. I have so many side projects and aspirations that I keep lists of my favorite ideas in my phone. Obstensibly so I can remember to work on them when I have time. The notes app I use has ideas scattered all over it, ranging from 3 word phrases to fully developed outlines. Quite possible the most important note in the app is my list of life goals. I don’t remember if I have ever let anyone see the whole list, but I am highly confident that I have set the bar unbelievably high. A few of the items I am willing to mention include finishing a 100 mile race, and taking a photograph that changes the world. There are other goals on the list that are even more outlandish, ones that seem even less possible than the ones I mentioned above. Some will take years of slow but steady progress, while others will take 3-4 months of sustained and uninterrupted effort. The problem is that since I have moved to Fort Wayne, I find myself comfortable. As I think about my list of goals I shake my head with incredulity that any one of them could be accomplished in my lifetime, that any of my goals are realistic. As I sit in my recliner, eating an entire frozen pizza by myself while reading some excellent science fiction, I find that my interest in changing the world wanes. The sense of freedom and independence is overwhelmingly enjoyable. I find that I am happy being simple and comfortable. My affairs are my own, and all I ask is to be left to them in peace. I think I am beginning to understand why people are able to just ignore the problems of the world. It is because we have found ourselves to be comfortable, and it is quite pleasant. If it isn’t happening to me right here and right now, it is so easy to ignore. Late on Saturday night, something remarkable happened. One of my life goals was completed! 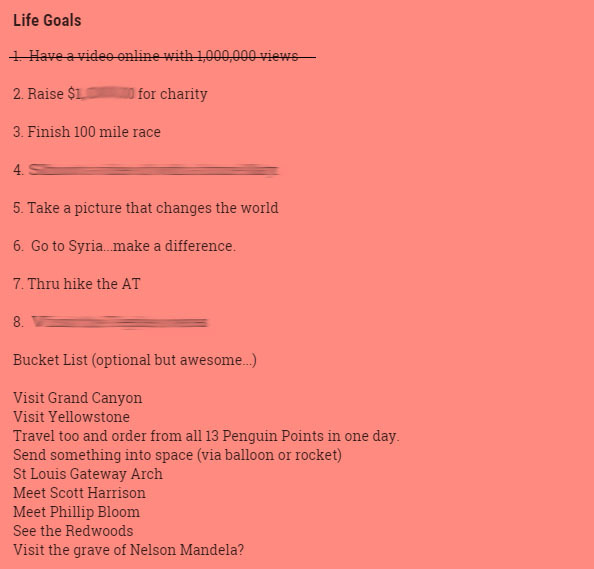 In fact, it was the very first goal on my list. For some reason I thought that having a video online with 1 million views was important. That happened Saturday night. For the first time ever, I get to mark an item off of my list! In fact, it happened with very little effort on my part. I simply edited the video, and waited. Once it was posted the hard work was already finished. As I reflect on who I was when I started my list, I question why I chose the things I did. Some of the goals are still something I am passionate about, while others have faded in importance. As I consider the work that lies ahead, I find I am afraid to start it, worried that the effort required may leave me empty in the end, or that I may find the completion of a certain goal is meaningless, as the completion of this goal certainly was. I worry that I will find myself comfortable, and unwilling to do the hard work that is going to be required of me to reach all of my “life goals”. So tonight as I celebrate the removal of one impossible goal from my collection of impossible goals, I have decided to replace it with another, even more impossible to accomplish. I do so because I do not want to be comfortable. I’ve decided that I want to die with many items marked off of my life goal list as done, but I don’t want to die with an empty list. I’ll use every bit of living I’ve been given. I wish to be known as a peacemaker. A goal I will pursue at the cost of comfort. I begin the pursuit now. Check out the video that has now crossed 1.6 million views here. 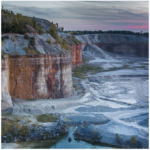 This entry was posted in Perspective on October 14, 2015 by Joshua.